According to a new report released by CareCloud and QuantiaMD, 65% of physicians see declining reimbursement rates as the top issue negatively affecting practice profitability. Not a surprise, since 2013 hasn’t exactly been a banner year for Medicare reimbursements. And due to April’s budget sequester, Medicare payments have been slashed by 2% across the board. These cuts are estimated to cost providers $11 billion in Medicare payments each year. This leaves many practices wondering if there are any ways to effectively counter these reductions. Thankfully, the answer is yes. 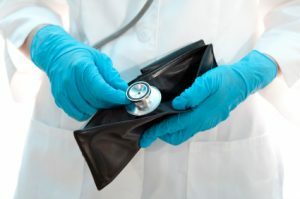 While there isn’t much you can do to stop reimbursements cuts, a proactive approach will help you negate the potentially disastrous effects of declining reimbursement rates. If you’ll be making less money per patient, a natural solution is to treat additional patients to make up for the loss. Finding patients to treat shouldn’t be a problem as 32 million patients are expected to join the healthcare system in 2014. A solid EHR will augment practice workflow and help you take on the upcoming patient influx without having to add more staff. EHRs increase efficiency with features like appointment scheduling and patient tracking. And with incentives like Meaningful Use and PQRS, EHRs can almost pay for themselves. Outsourcing billing makes up for declining reimbursement rates by bringing in higher net collections after cost. Software Advice calculated outsourced billing to bring in $1,496,000 after cost for a typical three-physician practice, compared to only $1,241,800 for in-house billing. The savings of outsourced billing come primarily from a decrease in staff costs plus the ability to bypass purchasing billing and collections software/hardware. If you opt to keep billing in-house, battle declining reimbursement rates by reducing claims denials as much as possible. On average, denials cost practices $25 to $30 each. There are a couple routes you can choose for reducing claims denials. One is going with a practice management system that reduces denials through patient eligibility checks and code reviews. This is the speedier and more effective route to correct claims. The other is to be meticulous when submitting manual claims. There are plenty of opportunities for your billers to make costly mistakes. It can be something simple like misspelling a patient’s name or something more complex like misusing CPT modifiers. Tax-deductible expenses are identified as almost any purchase that helps with operating a business. This article by Inc. cites home offices, business-related travel, the first $18,000 of equipment purchases and employee benefits as expenses that should be written off. Maximizing deductions can be a balancing act. For example, offering disproportionate benefits to your employees may reduce taxes, but may also be outweighed by the extra costs of benefits. Striking the right balance can mean an increase in revenue for your practice. Being proactive about overcoming declining reimbursements is essential for the success of your practice. Remember, inflation didn’t suddenly go down along with reimbursement rates. The problem will only get worse if not confronted right away. Check out the Practice Profitability Infographic for more results from the QuantiaMD and CareCloud report.